A light workout for Roger Federer at SW19 as he defeated Alexandr Dolgopolov 6-3 3-0 as the Ukrainian threw in the towel with an ankle injury after just 43 minutes. 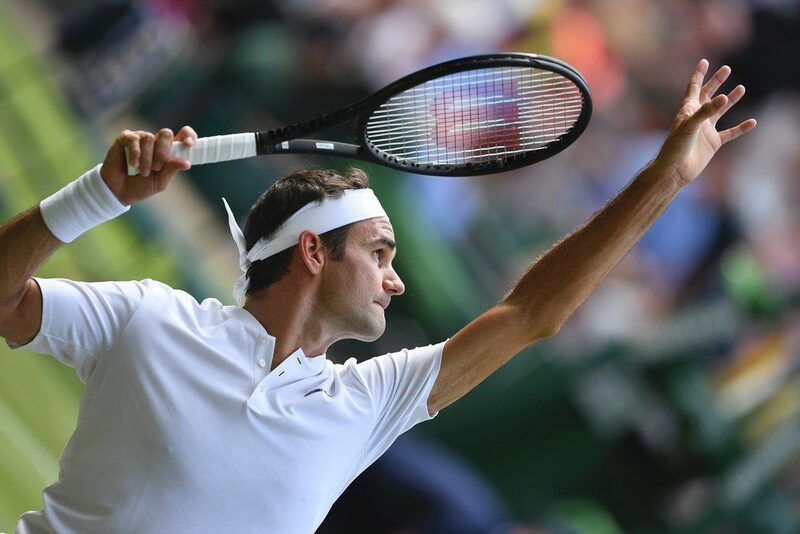 Despite the short nature of the match, it was still enough time for Roger to rack up another milestone, hitting his 10,000 Ace on tour and also becoming the leader for wins at Wimbledon with 85 now in the bag as he moves into Thursday's second round. So, easy start but a disappointing day for Centre Court ticket buyers as in the scheduled three matches they only saw four sets of tennis; with Martin Klizan pulling out at 6-2 2-0 down in his match against Djokovic earlier in the day. Federer won the toss and elected to receive. Dolgopolov won the first two points on serve, but a double fault at 30-30 all gave Roger a breakpoint, and although the Dog saved it, he lost the next 2 points to drop serve. Roger then held to 30 for 2-0, and the score moved quickly to 4-2. In Game 7 the Swiss held two more break points, again aided by a Dolgo double fault but the Ukrainian held for 3-4. Roger then held for 5-3. In his next service game another double fault from the Dog gave Roger two set points and he took the second to win the set 6-3. At the changeover, Dolgopolov had a brief consultation with the physio about an ankle problem. He continued but was broken in his opening service game to fall 2-0 behind. 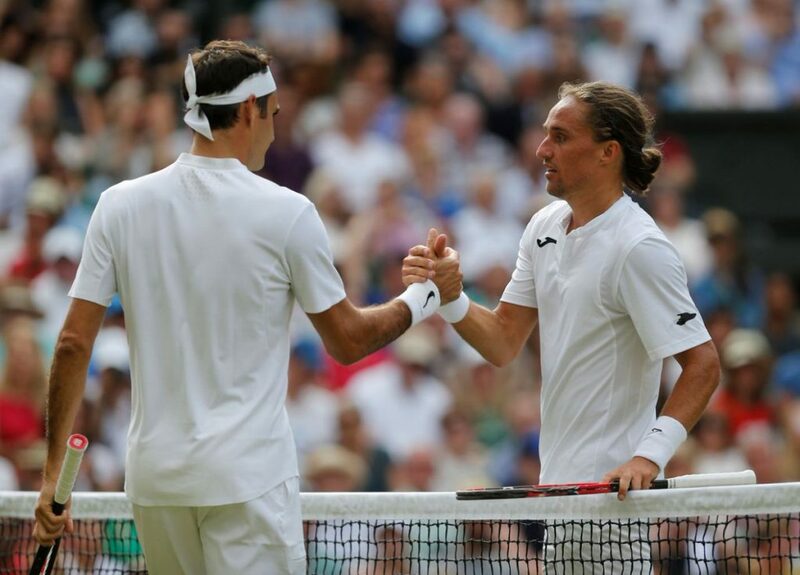 Roger held to 15 for 3-0 and after Roger hit a drop shot return winner to make 30-30 Dolgopolov came to the net offering a premature handshake to call it a day. Straightforward outing here for Roger against an opponent who's out of form and struggling with injury. Like I said in my Wimbledon preview Dolgopolov hurt his ankle in Rosmalen and obviously hadn't fully recovered for today. So what many thought would be a tricky first round turned into a virutal walkover. As a result, Roger got one and a quarter sets in of light practice and he looked in solid enough form. He served well, looked relaxed and was always in control serving ten aces in just six service games. Dolgopolov, on the other hand, hit four double faults and didn't have a single break point chance. Fed with the effortless repeatable motion holding easily, and the guy with the twitchy fast action firing in double faults; no real surprise. So good start, maybe not ideal to get a walkover but when it's so early in the tournament I don't think it makes much difference either way. Next up is Dusan Lajovic who defeated qualifier Stefanos Tsitsipas in straight sets. That's a good win for the Serb, and I think he will offer some resistance against Fed. They've never met before, but I'm sure Roger will know his game from the Davis Cup tie in 2014 where he played Wawrinka in the second singles rubber. It's not Lajovic's best surface, and he's never been passed the second round at Wimbledon, but he has a versatile one-handed backhand and I think he will compete hard, which is more than quite a few of the guys managed today 😛 . But regardless, I think Roger just has too much in his game to be in any trouble. Should be straight sets with maybe one of them going over 10 games. Very light workout for Federer who looked ultra relaxed in the 1.5 sets played before Dolgopolov packed in with an ankle problem. Not ideal to have a walkover in the first round, will have a bit of adjusting to do for his game in the second round. I honestly don’t like Roger’s draw this year (I admit I didn’t like Dolgopolov in the first round either), but hopefully the next match will be a more solid starting point for Roger’s campaign. Dimitrov can be a hard nut to crack for the third round. The Dog has barely played of late, and had no form coming in. NID ? I don’t think it matters at all the retirement, it basically just became a 6 match tournament for him if he were to win it. If it was later in the tournament then yeah prob not ideal, but now makes no difference. Ah yeah Wimbledon remove stuff quick from Youtube unfortunately. the amount of Ret in matches is quite a disgrace. players shouldn’t get in the main draw really when they are so unfit. the atp should address this issue. Fed didn’t play so smooth but the serve clicked and that’s all we need at this stage. I was thinking about this earlier, but it seems impossible to police. Read plenty suggestions but most of them don’t work once you think about them. Any other ideas? Yeah Dolgo gives no rhythm so tough to find that groove. 10 aces though, can’t complain. I kind of like the idea of replacing a withdrawal with a LL, though I think the allocation of prize money needs to be divided, not go totally to the withdrawer. Something like withdrawer gets 20% of the total R1 amount for each set completed. I understand you don’t want people playing hurt, but you also don’t want people playing when they’re really not fit, & withdrawing after 15 mins of play. Wasn’t Tipsarevich even less than that? And then they get the full prize money? That can’t be the best solution. I mean more for mid watch retirements? Luckly loser already comes in for withdrawals. A bit of a walkover here, shouldnt make a much difference though. Federer should be up and running next round..! P.s Rafa Looks strong to break his early exit jinx here. It maybe too early to call and yes upsets can cleary happen especially on the grass but I am putting my money on the “big four” to reunite in the semifinals. Not sure Muzz will last that long. And yes Cilic..
Millman a tailor made opponent though really. Has he got Khachanov if he beats Young? Can’t see The Donald doing much but you never know, clearly talented. Hello all and Jonathan! ! I have been Awol for a bit but have been reading a few of the articles here but I did not make comments like I usually do. Anyway happy with Fed up and running despite not having to play a full match! Kind regards to the fellow usual readers and commenters. Bit disappointing not enjoying a complete match from Roger and yet great to see him so fit and ready to go for another Wimby trophy. Yeah wasn’t great if you were a Djoker or Federer fan camping for 24 hours to only see 2 sets of play. I think it’s a good thing ultimately for Fed, he got some match play in and looked good for the short time he was out there. Not sure how to police the retirements really. Giving some money is an option but pretty easily abused so I don’t see it changing sadly. It’s very hard because it’s their job. Yes, pro sport is entertainment for which we pay but it’s still their job and to earn, they hv to play. Tipsy clearly Shld not hv taken to the court. 5-0 down in 15 mins… seems unacceptable. Klizan and Dog clearly frustrated by their injuries but where do you draw the line? Dilemma. Yeah I can’t think of many workable solutions that can’t be easily got around or that don’t affect those who get a real injury mid match. Yea Dolgo is good to watch, like I said if this was three years ago then tough first round. This year was always going to be a breeze I thought, and turned into a walkover. Rog looked fit and fast out there even over a set. Problem is so hv Rafa and Novak….it’s pretty open I think! Yeah Djoker looked fairly solid, always going to be how each respond to the first test. Khachanov for Nadal but he’s too inexperienced I think. Tsitsipas is still only 18 so no surprise really he went down in straights, & he acquitted himself well really. Lajovic will be a different kind of challenge but like you I can’t see Fed not having the weapons to deal with it. Expect Ljubi will have some input there too. I thought he’d get a set though, coming through qualifying. 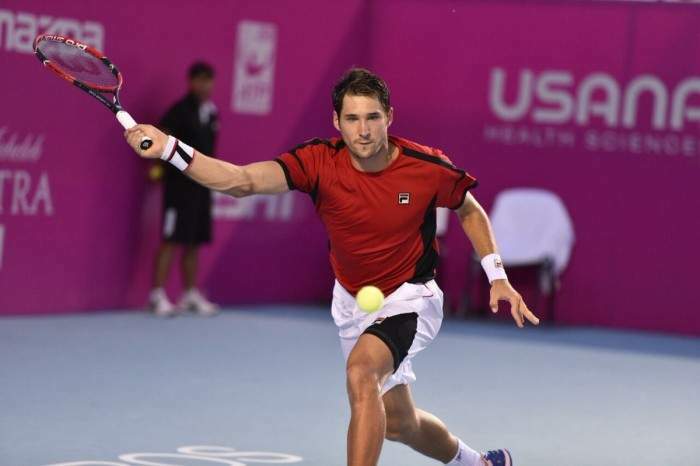 Lajovic should be easy pickings, but he will definitely compete. Played ok vs. Stan in DC that time. Nice and quick writing. Good job, jonathan. Roger looked good enough to pass the first round today while Dog didn’t show up either. I particularly focused on roger’s backhand. It didn’t look as good as in the hard court early this year. What do you think of it? I am a little worried about his backhand going back to its old mode. Which won’t help him facing the other big 3. Do you think it’s a strategy thing or a bad sign? Hard to say, using slice more for sure, but it’s pretty good on grass. See what happens next match. I have a solution to the “planned retirements.” Strap a lie detector to each player the morning of the match. Ha. I am pretty disgusted at the status of the Center Court. It already looks dirt green instead of lush green and its only day 2. The ball stops and bounces pretty high after hitting the turf giving the opponent time to set up his shot. This is more of a lesser version of a clay court than a grass court. RF slice shots, instead of skidding through, just sits up to be smacked. Halle is much faster than CC that its a shame. RF’s ROS and BH are virtually neutralized at CC. That means trouble all the way for RF. No doubt it is set up like this on purpose to encourage baseline play. RF has his serve working for him. His FH was lacking any sort of timing. wah I thought Im the only one who notice that…. And I thought its just my tv or something…..
How disappointing if this is true! Don’t they do it the same every year? How can it play differently to previous years? Do they try to help Nadal win another one or what?! This is definitely rigged to give Nadal a show. I haven’t watched any matches yet, but from what I’m hearing from pretty much every corner of the web, the grass is playing slow, and it spells trouble for Federer in the second week, when in gets much better for Nadal. I guess someone isn’t too happy that Rod Laver arena was faster. What they forget is that at one point, AO was played on Rebound Ace before they slowed it down. They year they slowed it down, Djokovic won. It was designed to end Federer’s monopoly. Wimbledon is supposed to have a surface that has lot of skid. That’s what grass is all about. With the increased break and high bouncing grass, they have taken away the degree of difficulty need to win the channel slam. Its got to a point its no longer a JOKE. I want to watch grass court tennis. Purposeful set up to get certain players into the final and cash in the profits at the expense of a few talented grass court players. There is no need to be panicking. We are watching grass court tennis and its typical weapons are working perfectly. Federer is safe, it will depend on how he performs – the 19th is around the corner. My reaction is: Is that it??????? well Im not complaining but maybe I want him to finish that match.. Double faults everywhere! I think Dolgopolov has a great shots and he was very quick that Fed looks like he’s not in the rhythm and cannot rush in the net… Many unforced errors..
tomorrow is my birthday and a good win will be a wonderful gift… 🙂 ajah! Go RF! I am dissapointed by those Wimbledon courts. I think the Halle guys should teach them how to make a proper grass court these days. Shameful for a tournament that is so prestigious. Halle courts aren’t great either really, not the stadium one anyway, not sure it gets enough sun / rain? Where is Fed’s new backhand? Not much in Halle and not seeing it today. Is he left mainly with the slice we’ve grown used to and discouraged about? Some specialists maintain that slice is better off on grass. But he still uses his backhand in some degree. We don’t need to be discouraged about Fed, maybe somewhat about the kind of grasscourt though. But our genius will be utmost persevering finding a possible way, I’m sure. Not totally sure he wins, but his chance is distinct. I think wimbledon was his main motivation to train and come back, so he’s for sure well prepared. Here is official Wimby site on the grass. Glad he is through 1st round, may need a few more sets to get used to grass condition at CC assuming organisers will put him there for all his matches. I feel bad for Dolgo, such a fun player to watch. Hope he recovers soon. Might play one on Court 1. Hard to say. Becker, Cash and McEnroe are all saying the court is playing slow, certainly significantly slower than Rod Laver arena. I wonder if it has something to do with the later start to the tournament, and it not being ideal timing for the grass to flourish. Either way, it’s not ideal, but the ball is still sliding a little. Looks like Fed might have some trouble in the second week, if it starts to play more like a slow hardcourt, if he comes up against a baseliner. I’m hoping he can adjust, but not rally a lot. Media picking up “death of wimbledon grass” story. Similar one in independent too.